Waldenburg/Crewkerne (Germany/UK), 30 November 2017 – IQD Frequency Products Ltd., based in Crewkerne (UK) and IQD Frequency Products Inc., based in Palm Springs (USA) are now part of the Würth Elektronik eiSos Group, thus expanding Würth Elektronik’s existing selection of passive components with a comprehensive range of quartz crystals and oscillators. IQD is among the leading manufacturers of frequency control devices in Europe. The company is active in over 80 countries. With IQD Frequency Products Ltd, Würth Elektronik eiSos is acquiring a company with a tradition dating back 44 years. IQD develops, manufactures and markets quartz crystals, oscillators, VCXOs, TCXOs, OCXOs, GPS-synchronised OCXOs and rubidium oscillators. The company also offers product solutions built to customer’s specifications. IQD’s products are specified by leading manufacturers in the industrial, communications, computing, consumer, automotive, aerospace, and medical industries throughout the world. 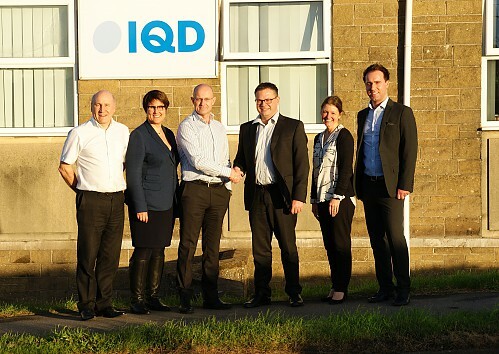 “With IQD our group has now acquired a highly innovative company with cutting-edge technologies and component solutions which are a logical extension of the range of products we offer. We are particularly pleased that we’re now able to offer valuable extensions for IoT, WiFi, GPS and 5G applications,” says Oliver Konz, CEO of Würth Elektronik eiSos Group. Thomas Schrott, CEO Würth Elektronik eiSos Group, goes on to add: “At IQD Frequency Products, the concepts of personal advice and support, from the original product idea, via prototypes and all the way to serial production are an integral part of the business model. These features fit in perfectly to our corporate philosophy ‘more than you expect’”. “We are constantly seeking to expand our range of services and competences in the area of wireless and frequency control solutions. The acquisition of AMBER Wireless in 2016 was a boost for our activities in the field of radio modules and IQD was our first choice for frequency products,” explains Alexander Gerfer, CTO of the Würth Elektronik eiSos Group. The ISO 9001, TS16949, and AEC-Q200 certified quality standards, and the excellent reputation that the company enjoys throughout the entire sector, were important for acquisition, too. This acquisition will enable the company to make even greater investments in the further development of technologies and products, which in combination with the Group’s unique service and added-value concept will create even more benefits and security for customers, the company and its employees.